“We are all brothers and sisters in this mission in supporting our communities. We are a resilient people and we did not get here to the threshold of the new millennium to give up now,” Judge Glenda A. Hatchett said last Thursday. Hatchett addressed nearly 100 people at the Equal Opportunity Authority’s Second Annual Family Conference entitled “Building Resilient Families” at the Savannah Marriot Riverfront. 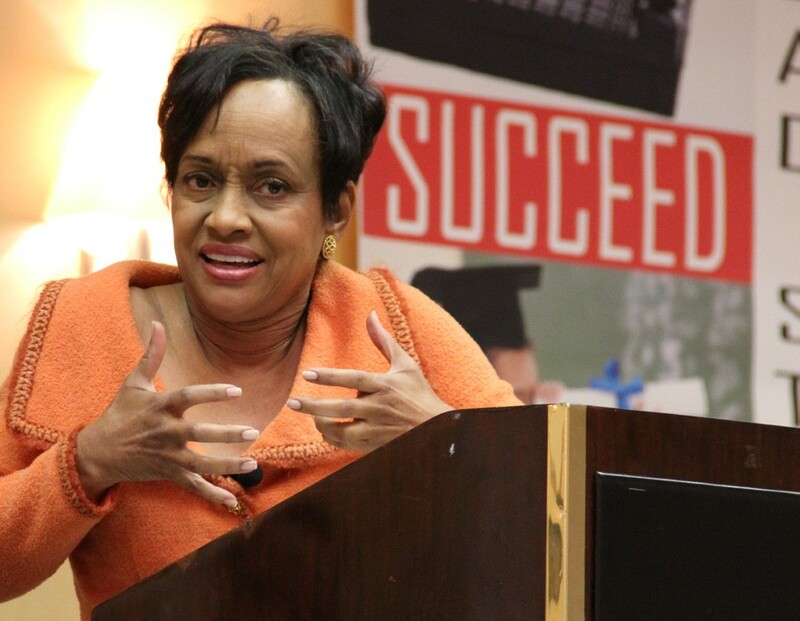 The two-time Emmy award winner for the “Judge Hatchett” show and Emory School of Law graduate, received standing ovations and applause as she spoke on the need for communities to come together to encourage change among today’s youth. “We can’t empower our children unless we are clear with our own empowerment,” she said. Hatchett quoting an excerpt from her book “Dare to Take Charge” cited a difficult time in her life when she was a law school student and working as a fulltime residential director. She hated law school and became so overwhelmed that she almost quit, however a meeting with her Aunt Francis changed her life. “My aunt said do you want to be a lawyer? Baby if it were easy everybody and their mama would do it. God has blessed you with a certain set of skills to do what it is you want to do,” she said. Hatchett, who visited the local Headstart earlier that day, said the community has to invest more in its children and ensure their safe passage from birth to adulthood. “There are too many folk in jail and strung out on drugs. If we don’t invest in Headstart early, we will pay dearly on the back end. We can’t talk about a father being absent if we don’t talk about how we can make him fully present,” she said. Hatchett said 24.8 million children live in poverty, 11 percent live in extreme poverty, 67 percent cannot read on a fourth grade level and 65 percent cannot do math on an eighth grade level in Georgia. She also highlighted that Georgia spends $9,649 per pupil, but spends 1.6 million times more on the prison system. The judge left the audience with a unique homework assignment.